Benjamin Zaligman was born in Dwingeloo in 1873, one of five children of Jacob Zaligman (Dwingeloo, 1840) and Roosje Heimans (Groenlo, 1839). 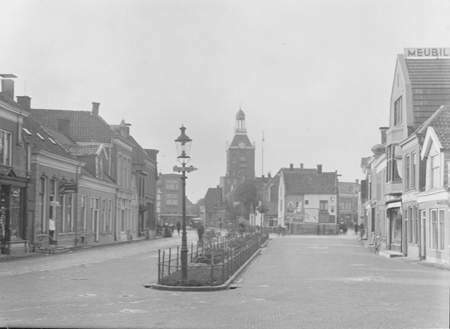 The two brothers Anton and Benjamin lived in Meppel. In 1916 Benjamin married Mietje Levie, born in Ruinen in 1883; she died in 1921. Benjamin married again, this time he married Mosina Cohen (born in Anlo, in 1886). They had two children: Jacob and Clara. Clara died when she was only six months old. Benjamin Zaligman had a small posture and was rather fat. No wonder, because they liked their family meals. Every week on Thursday, they would buy the best chicken on the market, intended for the Sabbath. The Zaligman family lived at 19 Prinsenplein, where they also had a small drapery. The quality of their merchandise was good, so Benjamin and Jacob had a good name in Meppel and the surrounding areas. Most of their income was undoubtedly not from the shop, but from their door-to-door sales. Benjamin and later his son Jacob travelled ‘met het pak’ (‘with a pack’) on their carrier bicycle with a basket for their merchandise. Father and son would go to the farmers in the surroundings of Meppel. When it was not so busy in the shop, Benjamin would stand in the doorway, looking around. One day, when his neighbour, Mrs Zandbergen, was washing her windows on the first floor, the sponge fell out of her hands and landed in the middle of the street. Benjamin saw what happened, stepped towards the sponge, grabbed it, and disappeared into the shop. Mrs Zandbergen, quickly said: ‘It’s my sponge.’ Zaligman, turned round, walked back and put it back on the street. Mrs Zandbergen had no other choice but to go down and pick up the sponge herself. Normally speaking, the textile shop of the Zaligman family was not very busy, but during the war, Benjamin and Jacob’s trade was completely over. The Germans took care of that. The worst moment without doubt was the 5th of May 1942, when Benjamin had to report the liquidation of his own business at the Chamber of Commerce on the Wheem. More than a year later the business was officially liquidated by Omnia, represented by Mr. E. Seuter. 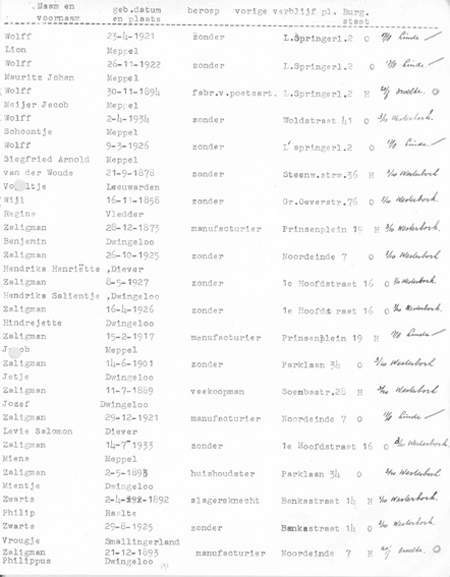 End October 1942 Mayor Wisman had to give the Germans a list with all names of the Meppel Jews that had been deported, including the Zaligman family. On the 20th of August 1942, Japie was taken via labour camp Linde to Westerbork, together with other young Meppel Jews. Not long before, he had been standing in the porch having a conversation with Mr Zandbergen saying: ‘When we come back, I will only smoke cigars of one guilder a piece.’ He never came back. Via Westerbork he disappeared to Kdo Sosnowice, where he died on the 1st of November 1943. For one reason or another (he was probably too old), Benjamin did not have to go to a labour camp. Together with his wife he was picked up on the 3rd of October 1943. Their story can be told in very few words: 5th of October 1943 transported to Auschwitz, killed 8th of October 1943. An empty (? ), sealed house was left behind. Some time later the house was bought by the Lunenburg family, who were very pro-German. These people took the whole inside of the house apart in order to find the money, most probably hidden by the Zaligman family, for when they would return. They probably found the money, because after that Lunenburg hardly ever worked. Just like Benjamin, he would stand in the doorway of ‘his house’. name in big letters on the roof of the building.